The Harvest Moon Pow Wow is anticipated to return with its traditional Native American dances and cultural activities to Gallipolis City Park Saturday. 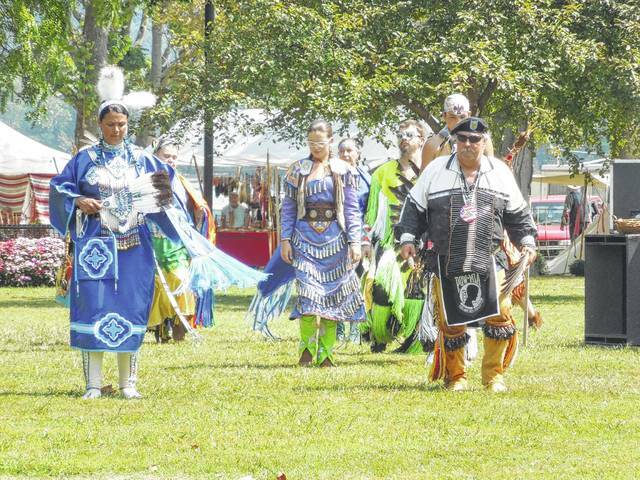 GALLIPOLIS — The 12th annual Harvest Moon Pow Wow will be returning to Gallipolis City Park Labor Day weekend to celebrate Native American heritage and organizers welcome the public to join. Events are anticipated to begin at 10 a.m. Saturday and finish Sept. 3. The Native American Education Association is a local group that started a little over a decade ago to help gain sponsorship for the Harvest Moon Pow Wow. They received sponsorship for the event from several groups including the Ohio Arts Council and local businesses. The group represents multiple tribes including Arapaho, Shawnee, Shoshone, Blackfoot, Cherokee and others. All three days have typically featured dancing, drumming, and singing in a time-honored way. Some dances welcome public participation and some have included dancers with traditional regalia. The candy dance brings children into the ring where they dance for candy. Other dances display the heritage of the Native American people; the men’s traditional dance, Jingle Dress dance, and Grass Dancing. Several vendors from across the country have been on hand as well in the past, selling items like pelts, pouches, braided and beaded items. Some vendors have also sold food following Native American recipes. A flint knapping demonstration is anticipated to be held as well. Area veterans have often been honored at the event as well with a few also participating in the dances. Thom Abrahamson, event participant, has said the Ohio Arts Council, the River Border Initiative and U.S. Senator Joe Manchin (D-W.Va.) have been supporters of the pow wow.